Throne Day, also known as Feast of the Throne, is a public holiday in Morocco that commemorates the enthronement of the incumbent monarch. Since 1999, it has been celebrated on July 30. 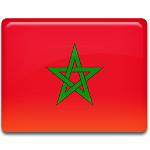 The Kingdom of Morocco is a constitutional monarchy. The head of state is the King of Morocco who holds vast legislative and executive powers. His decrees (dahirs) have the force of law. The King also has the right to dissolve the parliament (however, he must consult the Prime Minister and the President of the Constitutional Court first). Throne Day was established when Morocco gained independence and the title of Sultan was replaced with the title of King. During the rule of Mohammed V, it was celebrated on November 18. When his successor Hassan II ascended the throne, the date was moved to March 3. Following the enthronement of Mohammed VI, Moroccans began to celebrate Throne Day on July 30. Mohammed VI became King of Morocco on July 23, 1999 following the death of his father King Hassan II. The ceremony of enthronement took place a week later, on July 30, in the capital city of Rabat. Officially, Throne Day is a public holiday in the non-self-governing territory of Western Sahara, but its population is against Moroccan occupation thus they do not celebrate Moroccan holidays.